Koukijin teki Shaku - ZineWiki - the history and culture of zines, independent media and the small press. 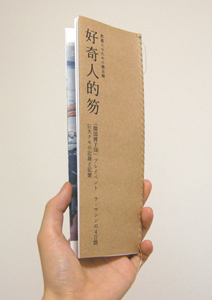 Koukijin-teki-Shaku(好奇人的笏) is Japan-based zine. Literally, "the note" written by "person with an inquiring mind". Features articles on the inspiring subject such as art, La machine, food and etc. Koukijin-teki-Shaku has two goals. One is to record one's feeling about wonderful things, and the other is to share them with every reader. Though everyone has his/her own taste, we believe that zingy talks overcome the difference. This page was last modified on 23 September 2009, at 04:25.